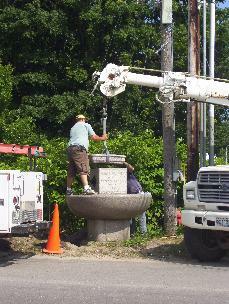 Summer 2009 we began the task of getting the horse watering trough on Main Street working again. 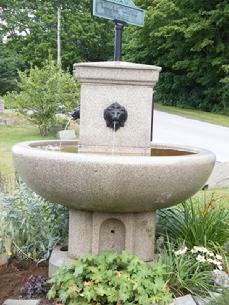 Some local volunteers helped to dig up and replace the water pump, lift off the top to clean out the drains and spouts, clean out the bowl (It had been used in previous summers to hold flowers), and install a timer. Merry Boone did the beautiful gardening around the base of both fountains. Thank you, Merry!